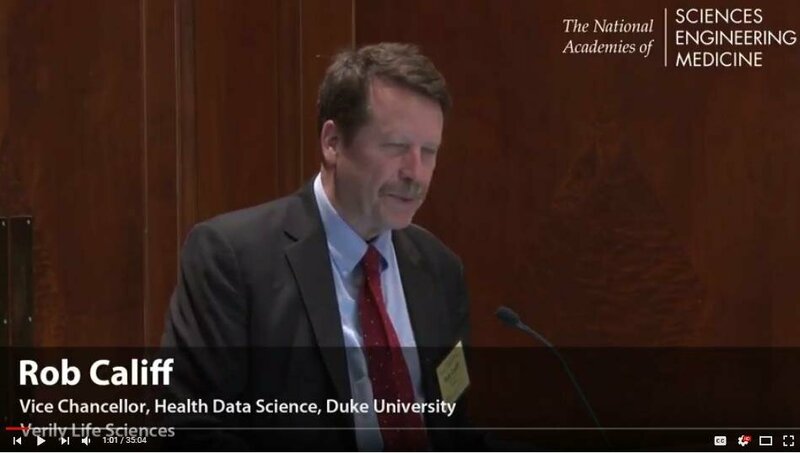 Professor Rob Califf, in a recent talk at the National Academies of Sciences, Engineering, and Medicine workshop on “real-world evidence” highlighted the failures of the current healthcare evidence generation system and presented a new approach to conducting randomised trials. You can watch the talk here. News: Research Waste – Focus on sharing individual patient data distracts from improving trial transparency and also makes it much harder to do randomised trials? As a result of the AllTrials campaign considerable progress has been made in the last few years to improve trial transparency. This is urgently needed as it is estimated that only around half of the trials that get done go on to be reported. News: How can “Quality by Design” make randomised trials better? Two of the key principles behind MoreTrials to do more trials better can be summarised as “focus on those things that matter” and “one size does not fit all.” This is very similar to the concept of defining upfront what matters for each randomised trial at the heart of Quality by Design (QbD). QbD defines trial quality as the avoidance of errors that matter to decision making with monitoring playing a central role in evaluation and improvement. Note that not everything matters only those errors that are identified upfront. QbD is a proactive task. In simple terms, QbD identifies before the start of a trial those critical factors that affect quality and puts in place effective processes to monitor these factors during the course of the study and, where needed, take corrective action. This is done for each individual trial. This individualised approach is in stark contrast to the one size fits all approach of most regulatory guidelines. By setting out detailed procedures that need to be followed most guidelines, ICH-GCP is a good example of this, lack any real flexibility. By contrast, at MoreTrials we want to develop guidelines that focus on principles rather than process. At the level of the individual trial this allows for flexibility in how things get done. An example of this would be the contrast between setting out a principle in a guideline to “record informed consent” compared to an inflexible approach that stipulates the detailed process that needs to be followed in order to record informed consent. Focusing guideline development on principles rather than detailed process allows for the flexibility that is part of the QbD approach. At the level of the individual trial this flexibility will allow more and better trials to be conducted. For more information on Quality by Design visit the CTTI QbD pages that can be found here. News: what is the ICH E8 guideline? The ICH plans announced at the start of this year to further revise ICH-GCP – so called “GCP renovation” – set out a strategy to first revise ICH E8, “General considerations for clinical trials” before commencing with a further and more substantial revision of ICH-GCP (E6). This seems like a sensible approach, but given the fact that relatively little is known about E8, in this article I want to look at this guideline more closely. Research Waste: why don’t trial participants take part in research again? Most people don’t take part in randomised trials, but those people that do are much more likely to take part in another trial in the future. From talking to trial participants the reasons for wanting to take part in a future trial are varied and include the positive experience of the current trial, wanting to continue to contribute to the development of new treatments and, more generally, placing continued trust in the research and research team.